Obama's Legacy: Institutional Change v. An "Example"
The New York Times' Matt Apuzzo is struggling mightily with President Obama's legacy re federal executive clemency. 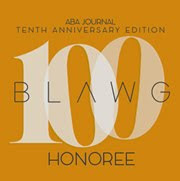 He notes Obama "is on pace to be the first president in a half century to leave office with a federal prison population that is smaller than when he was sworn in" and attributes this - in part - to the President's "aggressive use of presidential commutations," a somewhat problematic proposition from a variety of mathematical angles. But Donald J. Trump’s AG nominee, Sen. Jeff Sessions, is "looming" over it all. 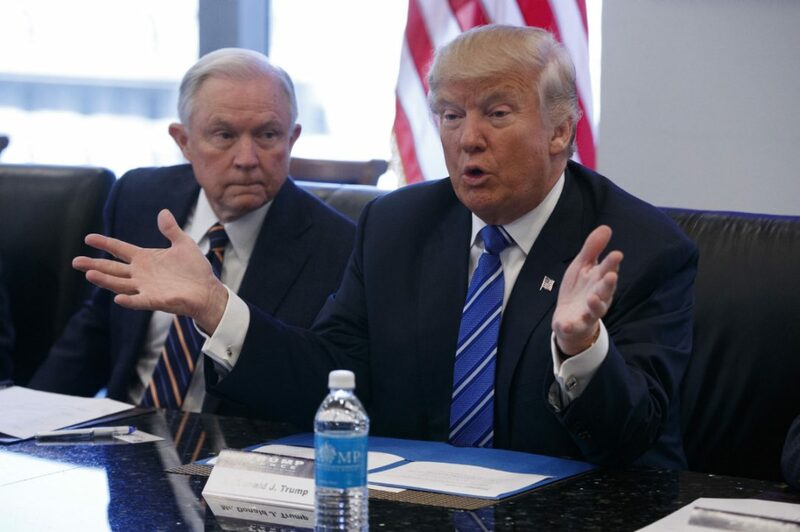 Sessions "strongly opposed Mr. Obama’s liberal approach to criminal justice ... favors vigorous enforcement of drug laws and the use of mandatory minimum sentences." Sessions (a former federal prosecutor) also credits "strict enforcement for today’s low crime rates." As Apuzzo sees it, "some of Mr. Obama’s criminal justice legacy is easily undone." As an example, he notes DOJ "policies," which "can be torn up." But the elephant in the piece is very clearly federal executive clemency - the pardon power. What is Obama's legacy on that front? What has he done that can be undone? Here, the story is not so pretty, and we can hardly point the finger at Trump or Sessions. Obama waited longer than any president in history (save George W. Bush) to grant the first pardon of his administration. 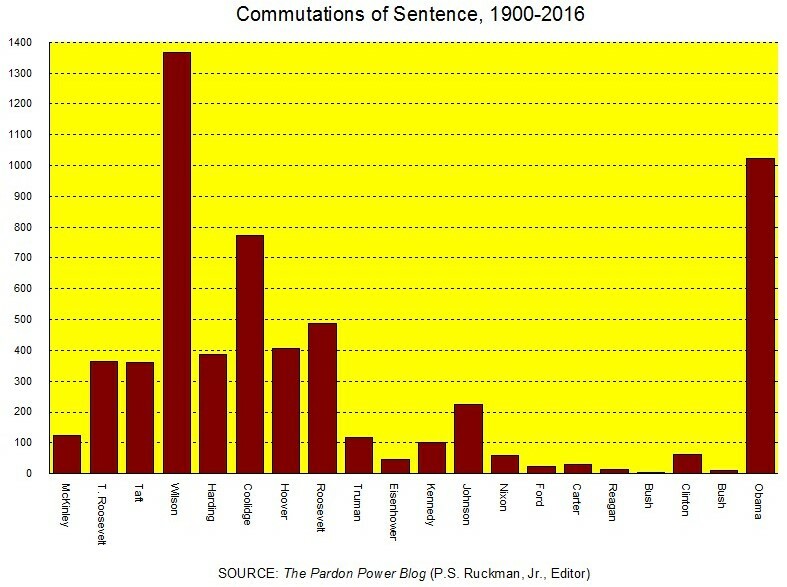 His first term, which featured a whopping one (1) commutation of sentence was the least merciful term since George Washington's first. Then, halfway through his second term, Clemency Project 2014 called for private lawyers outside of DOJ to vet commutation applications. This resulted in thousands of new applications - when record numbers were already coming in. 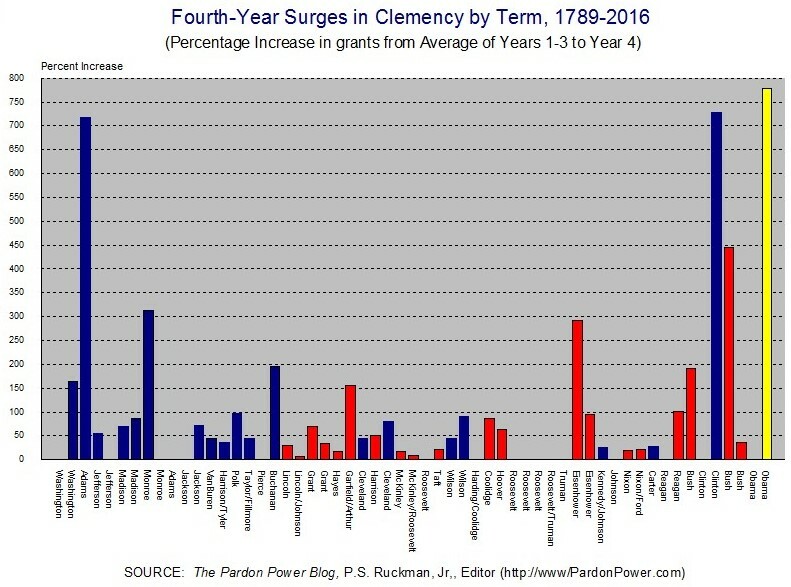 Thanks to the greatest 4th year clemency surge in American history, the President can rightfully make the narrow claim that he has granted more commutations than several of his recent predecessors, many of which were notably (if not proudly) neglectful re the pardon power. 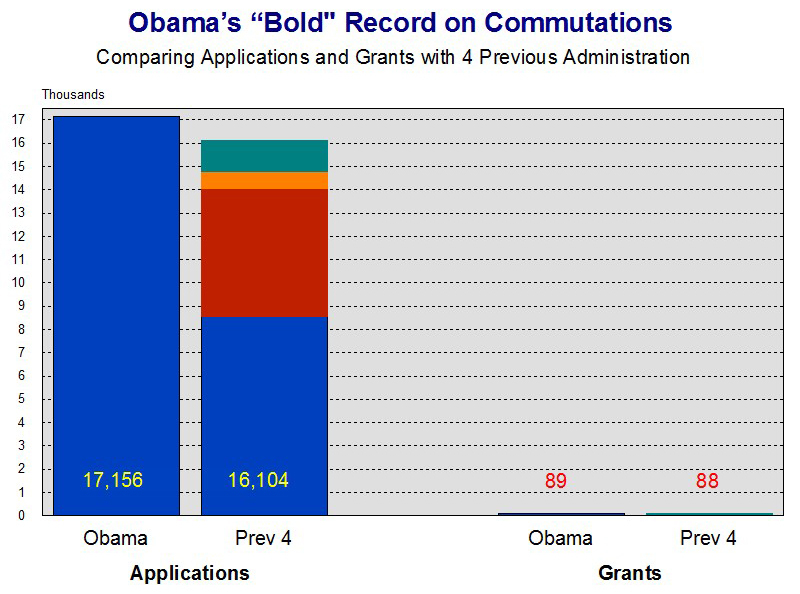 Many of Obama's commutations have been given to people who had life sentences. These second chances are an amazing things. No doubt about that. Deserved (we trust) and long overdue. But we shouldn't lose sight of the fact that 1) Obama has received many, many more applications than his predecessors 2) his record on pardons is abysmal. More importantly, for Apuzzo, the question should be: What institutional change with respect to the pardon power is the President responsible for? What tangible thing will he leave behind that anyone can point a finger at and say, "That is a remnant of the legacy of President Obama?" The answer is: nothing. The clemency process still resides in the basement of the Department of Justice, shepherded by career prosecutors. It pretty much remains a big bag of "no," a place where clemency applications go to be denied - or closed, - or left pending, sometimes for years (with mini-splurges during the Holidays, or at the end of the term). 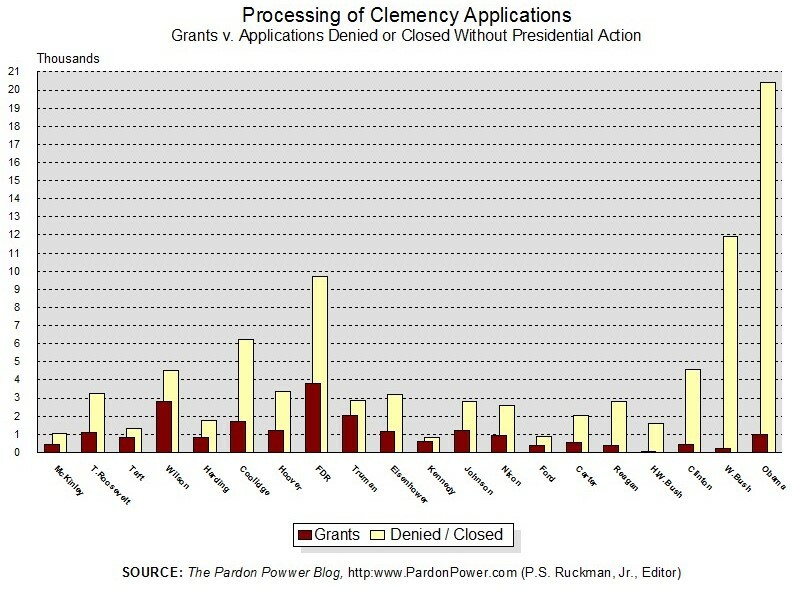 For years now, the clemency process has been completely immune from FOIA laws. Just no resources or time for that transparency jazz. Just ask them. They will tell you. When President Obama leaves office, that is what he will leave behind. 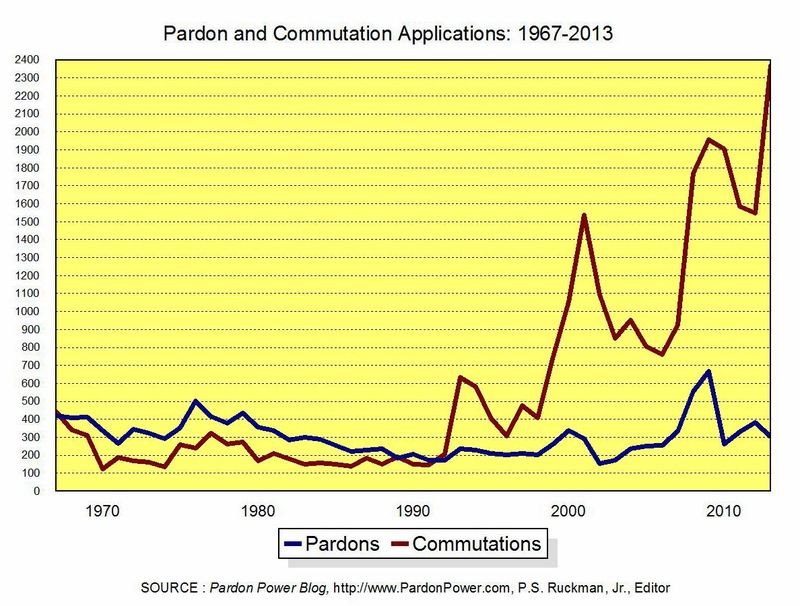 At best, we can say that, when it comes to the pardon power, President Obama was, at the end of his second term, extraordinarily generous with commutations of sentence for drug offenders. And his "example" can be easily enough ignored. That is really, really too bad. See full story here.